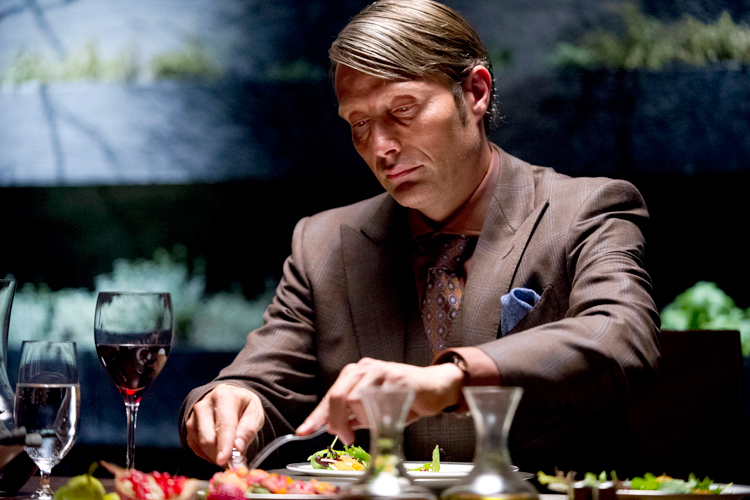 Hannibal Lecter was the original foodie. Thomas Harris’ brilliant crime-thrillers Red Dragon and The Silence of the Lambs showcased an unforgettable cannibal serial killer and were adapted in film versions with Michael Mann doing the first one as Manhunter, and the movie version of SotL becoming an instant classic. However, a bad thing happened after that. The film based on that one did well at the box office but took a critical beating. Then someone remembered that Anthony Hopkins had never played Hannibal in Red Dragon so a competent but uninspired second movie of it was put together and rolled out, but it didn’t rake in the cash. Shortly after that, Harris completely sold out his best known character by cobbling together an origin story in novel and screenplay that flatly contradicted much of what we’d been told about Hannibal. When Hannibal Rising hit theaters, it didn’t have the benefit of Hopkins so it crashed and burned with critics and audiences. This is where Hannibal had been left. A once great villain that had been overexposed by clumsy attempts to cast him as some kind of righteous avenger and defender of culture by munching on rude and tasteless people. Meanwhile, scores of books, movies and TV shows had done their own versions of genius serial killers and tortured souls chasing them with the help of high-tech forensics. Hannibal had sparked a trend and became a complete cliché in the aftermath. Which is why doing a TV series as a prequel to Red Dragon seemed like such a terrible idea. Hannibal wasn’t even going to be the first serial killer from a series of books to hit television since Dexter had been working that turf for years. With it being on the worst rated old broadcast network in NBC instead of an ediger cable network, this just seemed like it’d end up as another sorry chapter in the sad descent of Hannibal Lecter. Producer Bryan Fuller, best known for creating clever and quirky shows that get cancelled before their time like Wonderfalls, Pushing Daisies and Dead Like Me, came up with the idea of using some of the back-story in the novel Red Dragon to give us a new interpretation of Hannibal, and it looks like he‘s both taking the story back to it‘s roots while putting new twists on the old characters. In the pilot episode Apertif, Will Graham (Hugh Dancy) teaches criminal profiling at the FBI training academy. After a string of college girls are kidnapped and killed in Minnesota, Will is recruited by Jack Crawford (Laurence Fishburne), the head of the Behavioral Science Unit, to help find the killer. Unfortunately, the empathy and imagination that enable Will to put himself into the mind of a killer also result in borderline social disorders and make him unstable so Crawford brings in prominent psychiatrist Dr. Hannibal Lecter (Mads Mikkelsen) to hold Will together long enough to get the job done. That story should sound familiar to fans of Harris, but it’s what Fuller and company have done with stray bits of back-story from that one that made this pilot so good. Red Dragon started with Will Graham retired after nearly being killed while capturing Hannibal. Lecter is in custody and delights in tormenting Will with observations that he’s so good at finding serial killers because he’s one at heart. We never got see Will or Hannibal in their primes so this show is filling in a significant gap. Like the best adaptations, Fuller knows when to break away from the source material. Will and Hannibal never worked together in the book (It seems like this might be an idea Fuller picked up from the second film adaptation. ), and Will was not a bundle of near-crippling social anxieties despite his issues. There’s a critical event that’s part of Will’s history that is shown in the pilot, but with the new factor that Hannibal is not only present, he engineered it. Fuller has also gender flipped a couple of characters like Freddy Lounds going from ugly male sleazy tabloid journalist to an attractive female sleazy crime blogger. The show’s stunning visuals (Inspired by Fuller's love of The Shining) are haunting like a woman impaled on the antlers of a deer head or a field of decomposing bodies sprouting mushrooms in the second episode. These effects are also used well to show us how Will’s mind works. The Red Dragon book notes that Will pictures a silver pendulum swinging and stopping to clear his thoughts. In the show, a line that sweeps back and forth is used to depict how Will filters out everything he doesn’t want to see to work a crime scene. mushrooms that Will found in the woods. All of this has made the first two episodes good, but what elevates them to great is the way that Fuller has handled the main characters, and despite the show’s title, it’s Will, not Hannibal who has been more of a focus so far. Hannibal doesn’t even show up until halfway through the pilot, and that proves that Fuller knows what makes Lecter work. Where the last couple of books and films tried to make Hannibal the main character, the first two books are better with Will Graham and then Clarice Starling in the lead while Hannibal is the boogeyman who frightens and torments them. Since this is before he‘s been caught, this version of Hannibal has to seem somewhat normal, and Mikkelson does a great job of playing him as just a little off. Not so much that anyone would think he’s a serial killer, but enough to let the audience know that Hannibal is a shark swimming among schools of fish. When a blubbering patient drops a used tissue on his table, the momentary flicker of distaste that Mikkelson flashes makes you wonder if the guy is going to make it out of the room. Just showing Hannibal preparing and serving food to other people is enough to make a viewer’s skin crawl. Fuller has taken what could be a disadvantage in audience familiarity with Lecter and turned it into a way to generate tension just by having him around. It also allows them to focus on the more sympathetic character of Will, and this is another great performance for the show by Hugh Dancy who completely sells the idea of a man so sensitive that it could make him crazy. Will is a guy who compulsively saves stray dogs, but there’s some real darkness lurking there, too. His empathy can put him into the crime scenes to the point of detailed imaginings of killing people yet he can also feel the suffering of the victims so it’s a double-edge sword. Artistic themes are all over Harris‘ books, and it's almost as if the killers that Will chased were creating their own gruesome forms of expression, and that Will was the only critic who could correctly interpret it. There’s a great bit in Aperitif in which another dead young woman has been discovered. Will is almost offended at the crime scene, not because of it’s graphic nature, but because it’s immediately obvious to him to be the work of a copycat who harbored none of the oddly tender feelings he picked up on at the previous killing. He dismisses it instantly as an art expert would an inferior forgery, and what adds another dimension is when it’s strongly implied that Hannibal killed this woman simply to get Will pointed in the right direction by showing him the opposite of what he should be looking for. Even creepier, we aren’t sure what Hannibal’s agenda is in this. He finds Will interesting, but is the doctor trying to push him into darker corners to see if he can turn him from ‘critic’ to ‘artist’? Hannibal could be just toying with him while staying inside the FBI’s inner circle of serial killer experts for his own purposes, or he could genuinely think he’s aiding Will by his own twisted logic. We don’t know yet, but we know what Hannibal is and some idea of where it ends up thanks to Red Dragon so the prospects are horrible to think about. With only a couple of episodes aired and so-so ratings, there’s still a distinct possibility for this show to become yet another Fuller series cancelled before it’s time. It’s also hard to tell how long they could sustain this concept. At some point, it’s going to be ridiculous if a couple of serial killer experts like Will and Crawford can’t recognize the one under their noses. However, Fuller claims that he has a plan for couple of 13 episode seasons at least so hopefully this smart new interpretation of a 30-year-old story will get a chance to deliver on the potential it’s showing in the early stages. If nothing else, it’s turned an old and tired villain into something new and terrifying. Kemper will never eat mushrooms again after viewing the second episode of Hannibal. You can read his review of Red Dragon at his blog. This is epic. Well done! I also had no idea Fuller was such a Shining fanboy either. I knew that bathroom looked familiar! Thanks! Watching The Shinging on the big screen last night (Rubbing it in again. ), I was struck by how much of the show does look like it. Hannibal's office could be in the Overlook Hotel. As always, very nicely done Mr. K.
Very interesting. I saw only the last season of Hannibal. I was crushed when Fuller cancelled more seasons. I loved it. I am still watching the episodes over and over. The ending was fantastic. I think the two are in love, not in a bisexual manner in an intellectually deeper way than a physical love could ever be. I look forward to seeing Hannibal 4th season. Come on Fuller!